Opening a new credit card can be overwhelming. There are thousands of offers available and it can be hard to find a card that’s right for you. To make your decision a little easier, we did the hard work and found the best card offers for a variety of needs that can earn you rewards and provide discounts that can save you money. Below, we list our top picks in 14 categories that include no annual fee, travel, cash back, balance transfer and more, so you can find the best credit card for your needs. The Amex EveryDay® Credit Card from American Express is a well-rounded card that provides cardholders the opportunity to earn rewards, get out of debt and benefit from great perks. This card has a rewards program tailored to grocery shoppers where you can earn 2x points at US supermarkets, on up to $6,000 per year in purchases (then 1x), 1x points on other purchases. Plus, if you make at least 20 purchases in a billing period, you can earn 20% extra points on those purchases. And, there’s a welcome offer where you can earn 10,000 Membership Rewards® points after you use your new Card to make $1,000 in purchases in your first 3 months. If you plan on making new purchases that require you to carry a balance or transfer existing debt from a non-Amex card, there’s an intro 0% for 15 Months on purchases and an intro 0% for 15 Months on balance transfers. After, a 15.24% - 26.24% Variable APR applies. There is also a great money-saving $0 balance transfer fee. That’s compared with other cards that often charge a 3%-5% fee. Additional perks cardholders can benefit from include free two-day shipping at select online retailers with ShopRunner and exclusive access to various entertainment events like concerts and Broadway shows. Check out the best no annual fee cards. 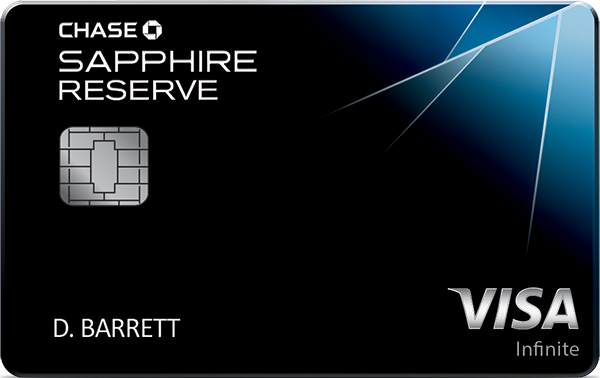 The Chase Sapphire Reserve® is one of the most premier travel cards available today, and it has the benefits to warrant a high $450 annual fee. Cardholders can earn 3X points on travel immediately after earning your $300 travel credit. 3X points on dining at restaurants & 1 point per $1 spent on all other purchases. $0 foreign transaction fees. Points can benefit from a fantastic 50% more value when they’re redeemed for travel via Chase Ultimate Rewards®. For frequent travelers, this is a great way to boost the value of your points. This card also comes with other travel perks that can help offset the $450 annual fee, such as a $300 annual travel credit that can be used for travel-related expenses like airline tickets, hotels and ride-share services. Added perks that can help frequent travelers save money include up to a $100 application fee credit for Global Entry or TSA Precheck®, no foreign transaction fees, travel protections and more. You can accelerate your reward earnings by meeting the requirements of the sign-up bonus — Earn 50,000 bonus points after you spend $4,000 on purchases in the first 3 months from account opening. Check out the best travel cards. There are numerous airline cards available that can help you earn miles at a quicker pace compared with a non-airline card. 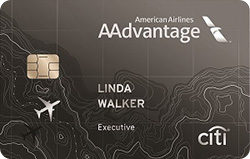 While the best airline card is subjective to the airline you prefer, we chose the Citi® / AAdvantage® Executive World Elite™ Mastercard® as our top pick for the numerous benefits it provides American Airlines fliers. When you fly with American Airlines, you receive a 25% discount on in-flight food and beverage purchases, first checked bag free for you and up to eight companions on the same domestic AA itinerary, priority check-in, early boarding and more. In addition, you can speed up airport security by applying for Global Entry or TSA Precheck® and receiving up to a $100 statement credit for the application fee every five years. This card also offers a complimentary Admirals Club® Membership, which allows you to access over 50 lounges worldwide so you can relax prior to takeoff or after landing. Regarding earning miles, cardholders Earn 2 AAdvantage® miles for every $1 spent on eligible American Airlines purchases & 1 AAdvantage® for every $1 spent on other purchases*. There is also a great sign-up bonus: Earn 50,000 American Airlines AAdvantage® bonus miles after spending $5,000 in purchases within the first 3 months of account opening*. Plus, each calendar year you spend $40,000, you’ll be awarded 10,000 Elite Qualifying Miles (EQMs). There is a $450 annual fee, but you may find the perks of this card worth it. You’ll need to spend $22,500 a year to pay for the card. A flat-rate cashback card is ideal for people who want to benefit from a good cashback rate on all purchases without the hassle of rotating bonus categories or activation. The Citi® Double Cash Card – 18 month BT offer sets the standard for $0* annual fee cashback cards with the ability to earn 2% cash back on purchases: 1% when you buy plus 1% as you pay, as long as you pay the minimum due each month. Plus, this card currently offers a sign-up bonus where you can no bonus. You can maximize cash back by using this card in unison with another cashback card — like the gas, restaurant, and grocery cards mentioned below. Simply use the Citi® Double Cash Card – 18 month BT offer for purchases outside the bonus categories to earn more than the 1% rate bonus category cards award everyday purchases. Additional perks include exclusive access to entertainment events with Citi® Private Pass® and Citi® Price Rewind, where Citi will conduct a 60-day search for a lower price on purchases you register. If a lower price is found you may receive the difference between the price you paid and the lower price. Check out the best cashback cards. The Amex EveryDay® Credit Card from American Express is a standout choice for a balance transfer card with its $0 balance transfer fee. Most cards charge a 3%-5% balance transfer fee that can add to the amount you already owe, so the lack of a BT fee is a great perk. Balances must be transferred within 60 days from account opening to benefit from the intro 0% for 15 Months (after, 15.24% - 26.24% Variable APR). This is an average amount of time to pay off your debt, and while you can find cards with BT intro periods as long as 21 months, those cards tend to have BT fees. This card has a decent rewards program where you can earn 2x points at US supermarkets, on up to $6,000 per year in purchases (then 1x), 1x points on other purchases. Plus if you make at least 20 purchases in a billing period, you can earn 20% extra points on those purchases. There’s also a welcome offer where you can earn 10,000 Membership Rewards® points after you use your new Card to make $1,000 in purchases in your first 3 months. Additional perks include free two-day shipping at select online retailers with ShopRunner and exclusive access to various entertainment events like concerts and Broadway shows. Check out the best balance transfer cards. When you’re a student, it’s key to start building credit early on. By using your card responsibly, you may be able to achieve a good or even excellent credit score upon graduation. The Discover it® Student Cash Back is a great choice for students with several perks. You can 5% cash back at different places each quarter like gas stations, grocery stores, restaurants, Amazon.com and more up to the quarterly maximum each time you activate, 1% unlimited cash back on all other purchases - automatically. 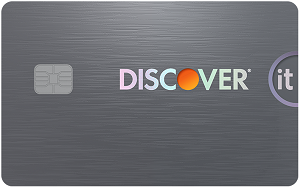 There is a unique new cardmember offer where Discover will automatically match all the cash back you earn at the end of your first year. That means if you earn $200 in cash back during your first year, Discover will match that and give you an additional $200 cash back. Students who travel abroad can benefit from the lack of foreign transaction fees. And, if you plan on buying textbooks, items for your dorm or other things, there’s an intro 0% for 6 months on purchases (after, 15.24% - 24.24% Variable APR). This card has no-penalty APR and no fees on your first late payment — which is a good reminder to pay on time. Check out the best student cards. (94) Over the Past 60 Days! A business credit card is a great way to streamline business expenses, and the Capital One® Spark® Cash for Business can help small business owners do that and more. You can earn a consistent flat cashback rate on all business purchases that you and your employees make at 2% cash back for your business on every purchase, everywhere. This card does come with an annual fee at $0 intro for first year; $95 after that — but if you spend $4,750 a year, you can earn enough cash back to cover the cost. Employee cards come at no additional cost. 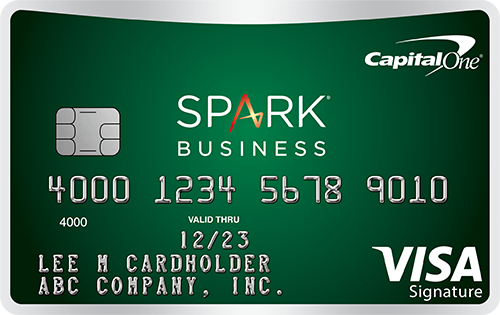 The Capital One® Spark® Cash for Business provides features for every type of business whether it’s travel (lost luggage reimbursement, Visa Signature® Luxury Hotel Collection), entertaining clients (Fine Wine & Food and sports discounts), or wanting to simplify financial management (downloadable purchase records and quarterly and year-end summaries). Check out the best business cards. 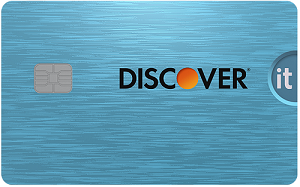 A secured card, like the $0 annual fee Discover it® Secured is a great way to build credit if you’re just beginning your credit journey. Secured cards are nearly identical to regular, unsecured cards, but they require a minimum security deposit. The Discover it® Secured has a typical $200 minimum deposit and provides the basis for you to work toward a good credit score. Plus you can earn cash back — which is rare for secured cards. Earn 2% cash back at gas stations and restaurants on up to $1,000 in combined purchases every quarter, automatically. 1% unlimited cash back on all other purchases. Discover takes the guesswork out of wondering when you’re ready for an unsecured card with monthly account reviews starting at eight months from account opening. During these reviews, Discover will review your account to see if you’re eligible to receive your security deposit back while still benefiting from using your card. Check out the best secured cards. As mentioned above, secured cards are a great way to build credit and can help you improve your credit score. The Discover it® Secured is our top pick for people that are considered poor/new . This card requires a typical $200 minimum security deposit and Discover will perform account reviews starting at eight months from account opening to see if you’re eligible to receive your deposit back while still enjoying the benefits of your card. There are plenty of unsecured credit cards for people with less-than-stellar credit, but those are often characterized by high fees and tricky terms. We recommend sticking to the Discover it® Secured which has a $0 annual fee and cashback program — earn 2% cash back at gas stations and restaurants on up to $1,000 in combined purchases every quarter, automatically. 1% unlimited cash back on all other purchases. Check out the best credit cards for bad credit. 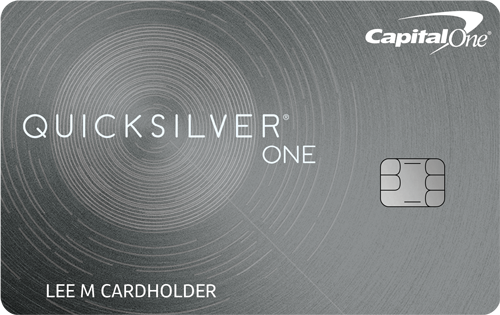 If you have average/fair/limited credit, it may be hard to find a credit card with reasonable terms, but look no further than the Capital One® QuicksilverOne® Cash Rewards Credit Card. It has a $39 annual fee, but that can be offset by spending $2,600 a year since you 1.5% cash back on every purchase, every day. This is a Visa Signature® card, so you’ll receive various benefits that can save you money, such as shopping discounts at select premium retailers, lost luggage reimbursement, access to room upgrades and discounts at hotels part of the Visa Signature® Luxury Hotel Collection, and more. Check out the best cards for average credit. The Amazon Prime Store Card is a fantastic card for online shopping and can earn you 5% back at Amazon.com. This is one of the highest reward rates provided by any card and the savings can add up for avid Amazon.com shoppers. Note that while there’s a $0 annual fee, you’ll need a Prime membership — currently $119 for the annual plan — to earn rewards. This is a store card, so you can only use it on Amazon.com purchases. If you want to earn rewards outside of Amazon.com, there’s the Amazon Prime Rewards Visa Signature Card which can be used anywhere and earns 5% back at Amazon.com and Whole Foods Market, 2% back at restaurants, gas stations and drugstores, 1% back on all other purchases. Similarly, the Amazon Rewards Visa Signature Card can be used anywhere and doesn’t require a Prime membership, but the rewards rate is lower at 3% back at Amazon.com and Whole Foods Market, 2% back at restaurants, gas stations and drugstores, 1% back on all other purchases. The information related to the Amazon Prime Rewards Visa Signature Card and the Amazon Rewards Visa Signature Card has been collected by CompareCards and has not been reviewed or provided by the issuer of this card. Check out the best store cards. The Bank of America® Cash Rewards credit card is a $0 annual fee cashback card that’s ideal if you frequently spend on gas. You can earn 3% cash back in your choice category, 2% cash back at grocery stores and wholesale clubs for the first $2,500 in combined choice category/grocery store/wholesale club quarterly purchases & 1% cash back on every purchase. That’s a good rate for gas purchases and can earn you more cash back compared with general-purpose credit cards that may offer as low as 1% cash back on all gas spending. This card also has a sign-up bonus where you can receive a $200 online cash rewards bonus after you make at least $1000 on purchases in the first 90 days of account opening. 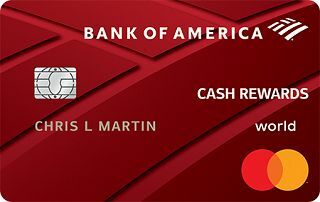 There aren’t really any other perks that set the Bank of America® Cash Rewards credit card apart from competitors beyond the rewards program tailored to gas spenders. Check out the best gas cards. (221) Over the Past 60 Days! 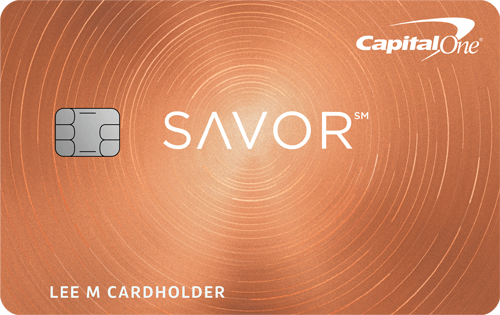 The Capital One® Savor® Cash Rewards Credit Card is a standout card for foodies, offering the highest rewards rate for dining purchases. You can earn 4% cash back on dining; 4% cash back on entertainment; 2% cash back at grocery stores; 1% cash back on all other purchases. plus, earn 8% cash back on tickets at vivid seats through may 2020.. New cardmembers can also benefit from the sign-up bonus — Earn a one-time $500 cash bonus after you spend $3000 on purchases within the first 3 months from account opening. This card does come with an annual fee at $0 intro for first year; $95 after that, but if you spend $2,375 a year on dining — after year one — you can offset it. Additional benefits include travel accident insurance, no foreign transaction fees, inside access to premium experiences in dining, entertainment, sports and more. Check out the best cards for restaurants. The Blue Cash Preferred® Card from American Express offers the highest cashback rate among grocery cards with 6% cash back at U.S. supermarkets (on up to $6,000 per year in purchases, then 1%). 3% cash back at U.S. gas stations, 1% cash back on other purchases. There is also a welcome offer where you can earn $200 statement credit after you spend $1,000 in purchases on your new card within the first 3 months. There is a $95 annual fee, but if you spend $1,584 a year at U.S. supermarkets, you can recoup the fee. In addition to a cashback program, this card offers an intro 0% for 12 months on purchases (after, 15.24%-26.24% Variable APR), which can be helpful if you plan on carrying a balance month to month during your first year of account opening. Additional perks include free two-day shipping at select online retailers with ShopRunner, exclusive access to entertainment events, travel accident insurance and more. Check out the best grocery cards.